Welcome to Elvis Van Gogh website! This painting was owned by Elvis. 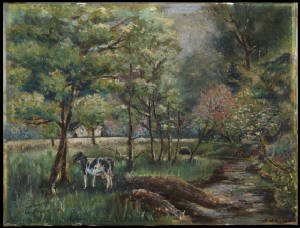 This original oil painting "Cow in the Meadow" is attributed to Vincent van Gogh, painted in 1883 and signed "Vincent". Elvis then signed and dated the painting over Vincent's signature. The painting with the original frame is for sale. The information cited will be provided for review along with a complete provenance, scientific and academic research. Elvis A. Presley signed and dated the painting in 1952, originally intending the painting as a gift for his mother "Gad" and grandmother "Dodger". The family was living in the same home in 1952 which included Vernon, Gladys, Elvis and Minnie Mae Presley. On the reverse of the painting is the priceless dedication to both mother and grandmother from Elvis. The attributed artist, Vincent van Gogh signed and dated the painting. The oil on canvas was painted "69" years prior to Elvis adding his signature. Elvis Presley signed and dated '52 the painting. This painting is attributed to Vincent Van Gogh in 1883 and orignally owned by Elvis. The painting is for sale by the owner.